Home / Flamingos / My Jordan Diary, DAY 4, Flamingos, Maka Why? My Jordan Diary, DAY 4, Flamingos, Maka Why? It is already basic for us Young Reporters to be in class by 9:30 am. So it's absolutely your business when you sleep or wake up, just don't be late, that's what is important. So my day started as usual, but with the Nigeria versus Brazil game occupying my thoughts. It was their first game of the tournament and I knew it would be really exciting to start on a bright note considering how tight their group seemed. Again, I would be at the match venue to produce a match report after the game and I was thinking about that too. The fact that the Flamingoes were playing on the day was the more reason I remembered it was our dear country's independence day - celebrating 56 years of a lot of things. Of course that would make for a good story whether they win or not. With all that in mind, I went for breakfast, where I welcomed a new member to my breakfast family. Fried egg. I had in mind the usual one I do at home in Nigeria, where I crack the egg (or eggs as the case may be) into a bowl, add a pinch of salt, slice onions into it and add pepper, beat it thoroughly to mix and then pour in hot oil to fry brown. Oh well, I thought wrong. I was served a white egg with a dripping yoke at the centre and I had no option but to eat it. It wasn't bad at all, but I don't intend to order for it next time. 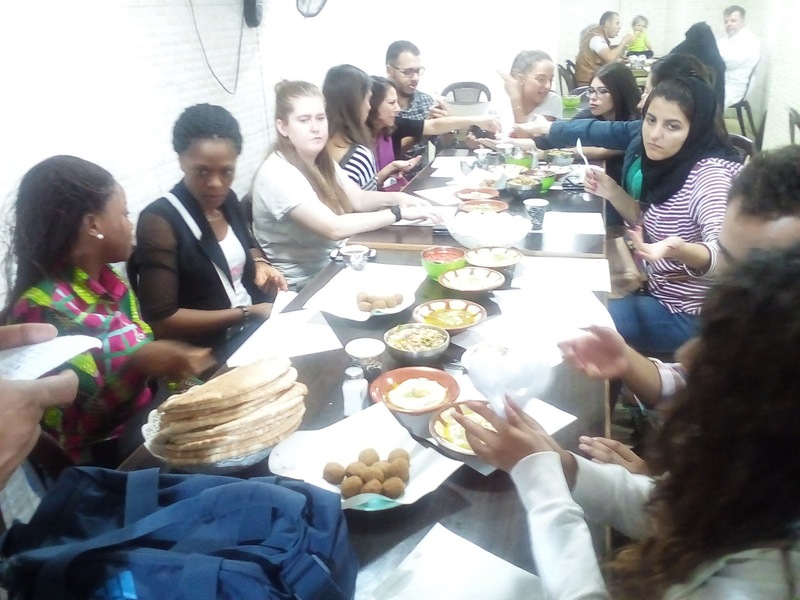 Our class today was intense for the first time and for a start, AIPS mentor Riccardo made us understand that we were actually not prepared for the coverage of Jordan 2016. To prove it, he made us do a little exercise, which largely exposed our ignorance regarding some of the important and influential figures in the Hashemite Kingdom. That done, he explained the essence of preparation in our job as journalists, saying, a guy could walk into the stadium that will make a difference in your story. He then highlighted the need to DOUBT, be CURIOUS and also GOSSIP (Don't get it twisted, in this case, gossip is not speaking about someone behind their back). Afterwards, we had Keir talk to us about FIFA's organogram before giving us our assignments for the day. Those for the King Abdullah II Stadium in Amman where Nigeria would play, left at 1:30 pm and was at the stadium 30 minutes later. As I was setting up my laptop at a corner where it could be charging while I worked, a middle-aged lady behind me said "hi, I presume you are Nigerian", and I said yes. She then said she was commentating for the match between Nigeria and Brazil and needed help with some of the Nigerian names. You can imagine how I felt. Trust me, I did not disappoint. She would later thank me again after the match. Then about 30 minutes to the game, I decided to record a one minute preview video which was on my “to do” list for the day. And to be honest, it was amazing the number of likes, loves, comments and shares I got for the video. So I want to thank you for the encouragement. It was my opponent for the day Victor from Brazil that did the filming for me. 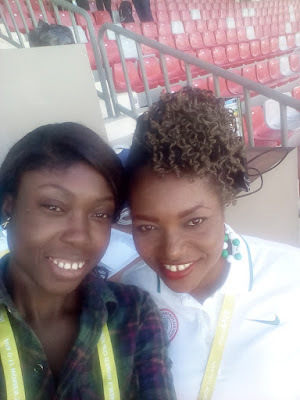 Inside the stadium, I took a selfie with Flamingoes Media Officer, Isabella as we wished the team all the best but in the end, they disappointed us and every other Nigerian back home with their disjointed display that yielded nothing. So much that coach Bala Nikyu had to utter the classic quote of his players being frightened by the name 'Brazil' and my first thought was "maka why?" The Brazilians were not even all that on the day. Anyway, that one is gone, it's time to move on and be strong like I always say. I submitted my match report, stayed for the England versus North Korea game which was a lot more interesting that Nigeria versus Brazil, and headed back to the hotel after an eventful day. Awesome article. Very human and personal like u are inviting us into ur world. The new egg format is called sunny side up depicting the way the Sun looks in the sky and the runny part is called Yolk. We love what you are doing. Keep up the good work Chi. I knew how you felt when that commentator approached you- You were on top of the world as having to teach somebody your languages and intonations Hahahaha. I salute your intelligence.